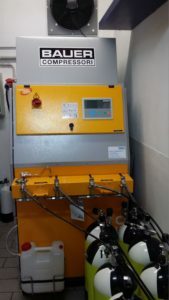 Large tanks 40/50 l x 200 bar to refill Oxygen and Helium (special requests .ie. specific partial pressure, should be agreed in advance). 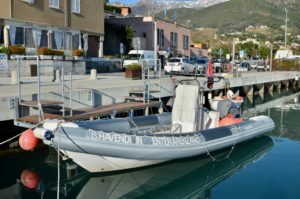 Inflatable boat (Lenght 9,00 mt., width 3,30 mt., large space inside, Yamaha 300 HP motor, (12 – 16 pax) especially designed for HAVEN DIVING CENTER. 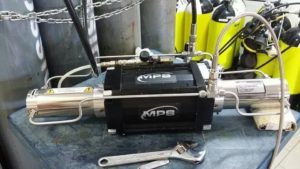 Deco Station 3-6 m with single tank (10- 15 l) filled with air and double regulator closed under pressure, available for divers. 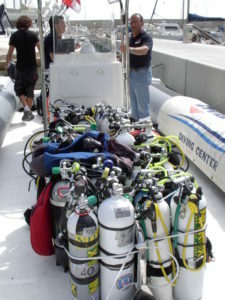 Oxygen Tank at – 6 m, set as the diving plan reccomends.